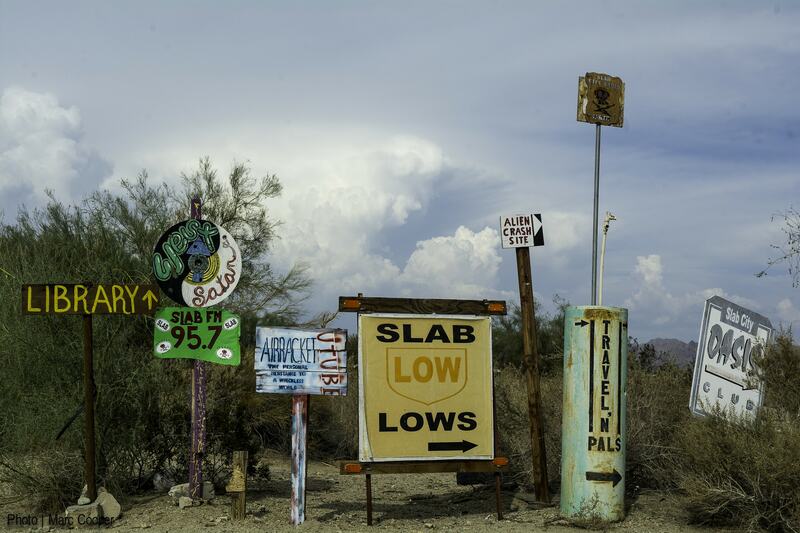 It’s said that no one can write the true story of Slab City. Its past is, at best, fragmentary and imprecise. A 1902 census, which divided this part of California’s Sonoran Desert into plots, indicated that this part was destined, already a century ago, to house free public schools. The concrete slabs from which the city’s name is derived, were poured in May of 1942, part of the foundations for a Navy training base. A registry, having survived to the present day, notes the mobile homes and trailers installed in Slab City from 1980 to 1997; it indicates that in 1992, the year of city’s peak population, there were some 872 homes in the area. Today, the anarchic Utopia is said to be the last truly free space in the world. The Slab City library lends its books without a return date and they don’t have cards. They’re divided into sections, but not arranged in alphabetical order: it’s an anarchist library emulating the spirit of its librarian, Cornelius Vango. He explains that the strange rules are due to the fact that he doesn’t want there to be a single reason for someone not to take a book home – even when many visitors are but passing by and won’t return what they’ve borrowed. Four years ago, Vango took over the only Slab City library, the history of which (like that of the city itself) defies definition or even a chronology. The library was founded by a woman named Rosalie who died in 2003. Her grave is immediately outside the library. After her death, prior to Vango’s taking command, many tried without success to take over. People took the books, and nobody wanted to invest in newer editions. But through donations and savings, the current librarian has managed to amass a collection which today includes of thousands of books, divided as they are into fiction and nonfiction. 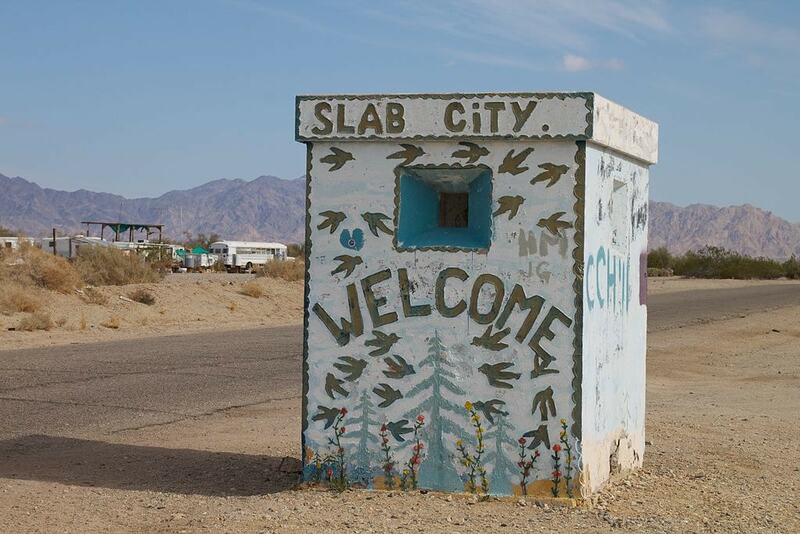 Of all the spaces in the world inhabited by travelers and people living nomadic lives, Slab City’s particularity is in the way it combines its community’s autonomy, and the needs of its inhabitants, with controls and rules. These three aspects make it not just unique but require quite a lot of work and effort on the part of its inhabitants – to survive, as they do, the brutal desert summers. An anarchic city of a very distinct architecture, it also has its own notions of urban planning and infrastructure. And all of this is despite the difficulties inhabitants experience in building or even acquiring materials. 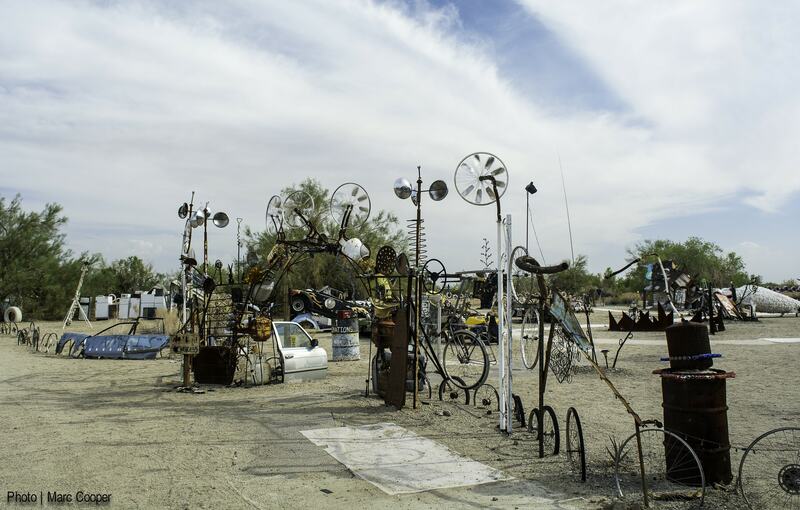 Construction is, above all, an important expression of freedom: in Slab City one can build anything one wants because there are simply no rules restricting this or nearly any other activity. That’s why the local library has no door. It never closes.